On Sale Now! Free Shipping Included! Save 5% on the VTech Go! Go! 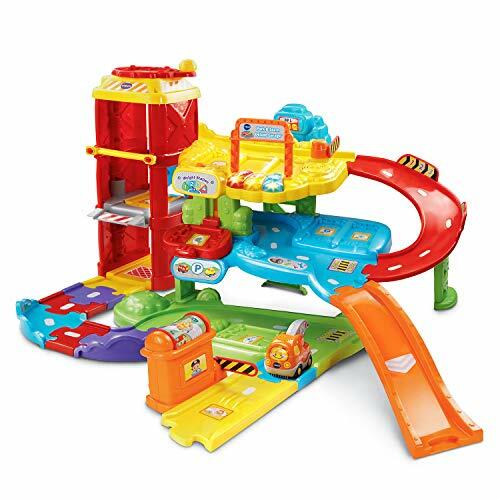 Smart Wheels Park and Learn Deluxe Garage by VTech at Spoil the Baby. MPN: 80-180000. Hurry! Limited time offer. Offer valid only while supplies last. Playtime with miles of learning! Park, play and explore on three stories of interactive learning fun with Tommy and his tow truck at the Go! Go! Playtime with miles of learning! Park, play and explore on three stories of interactive learning fun with Tommy and his tow truck at the Go! Go! Smart Wheels Park and Learn Deluxe Garage by VTech. Learn about colors, the rules of the road and play fun sing-along songs and melodies by pressing the three light-up buttons. Roll the SmartPoint tow truck over nine SmartPoint locations to hear different phrases, music or fun sound effects. Press the toy tow truck’s light-up button to hear three sing-along songs and learn the letter T and the name of the vehicle. Build motor skills by placing the tow truck in the elevator and turning the helicopter pad to raise the elevator to any floor on the toy garage. The elevator recognizes each floor with fun sounds and phrases. Use the seven included track pieces to connect to other Go! Go! Smart Wheels and Go! Go! Smart Animals playsets (each sold separately) to encourage creativity. Features durable design, automatic shut-off and volume control. Playset requires 2 AA batteries (not included). Tow Truck requires 2 AAA batteries (batteries included for demo purposes only; new batteries recommended for regular use). Assembly required. Intended for ages 1 to 5 years. Roll SmartPoint tow truck over 9 SmartPoint locations to hear different phrases, music or fun sound effects; includes 7 interchangeable track pieces.